A metallised polish for extreme strength and durability coupled with ease of removability. Produces a deep shine with excellent slip resistance. Responds brilliantly to all spray burnishing techniques. To enhance and protect black asphalt, rubber and sealed floors. DIRECTIONS: Seldur Black must be applied to a clean grease free floor. Strip old polish with Selate then rinse thoroughly with clean water, allow floor to dry. 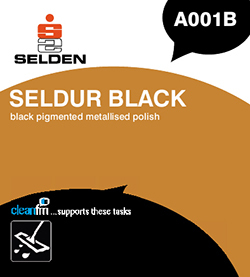 Apply a thin even film of Seldur Black using a clean lint free mop or applicator. Apply a second coat when the first is dry (approximately 30 minutes). May be buffed as required to enhance gloss. COVERAGE: 60 square metres per litre. Composition A blend of acrylic copolymers, resins and copolymer wax incorporating wetting agents and film forming aids in a stable water based emulsion form incorporating metal cross linking additives.